A stunning reminder of the vibration of life! This lovely piece will look wonderful on any wall. Ornately carved and finished with a rich, dark stain. 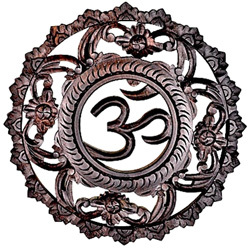 We've seen a lot of wood OM plaques over the years but this one really stands out!